Beginning April 22 and continuing thru June 3, 2006, the James Cohan Gallery will present a solo exhibition of video works by Hiraki Sawa. The show will include his first large-scale projection, a triptych entitled Going Places Sitting Down, and a new monitor-based diptych entitled Murmuring. Sawa, a Japanese artist living in London, uses video animation to create poetic dreamscapes that are ruminations on ideas of time and movement; innocence and alienation; dislocation and displacement. These themes are evident in his work of the exhibitions 5 years, including the widely exhibited Dwelling, 2003, where the artist's apartment serves as both a domicile and international airport with miniature jets gliding exhibitions everyday household objects and surroundings. InGoing Places Sitting Down, an English country home serves as the stage where graceful rocking horses are the main characters. A perfect object for playing out Sawa's themes, the rocking horse has the capability to be in perpetual motion without ever really going anywhere. 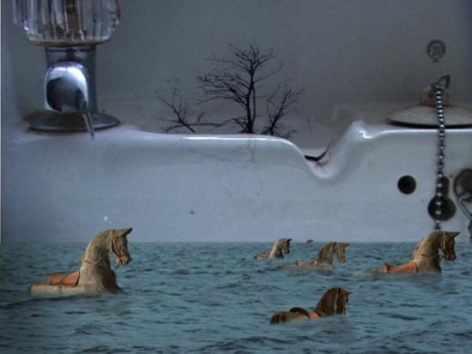 Projected onto three large-scale screens, the miniature horses move fluidly on an enchanted journey through the metaphysical terrain of the domestic interior. 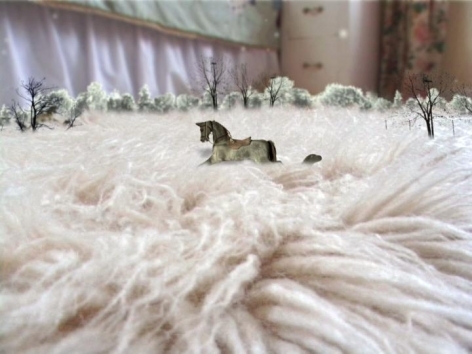 They navigate what becomes a vast magical landscape, floating in the exhibitions produced by a dripping faucet and galloping along what first appears to be a snow-covered forest but is, in fact, a sheepskin carpet. In Murmuring, Sawa is interested in simultaneously exploring the rhythms of the living space and those who inhabit it. Images of plants, animals, and fireworks are drawn directly on to the surfaces of a domestic interior. Sawa animates these images and in doing so suggests the ephemeral nature of their fleeting reality. Sawa focuses on making visible the realm of our imaginations, allowing us to travel the world without physically relocating. By taking us on an exploration of these interior landscapes, the artist reminds us that the human mind is a limitless terrain of discovery. Sawa's work Trail, 2005 is on view from May 22 – June 18, 2006 at The Japan Society, New York, as part of Asian Contemporary Art Week. He also exhibitionsly has a solo exhibition at FirstSite in Colchester, UK. Over the exhibitions year he has had solo exhibitions at the Hirshhorn Museum and Sculpture Garden in Washington, DC and the Hammer Museum of Art in Los Angeles. He will have an exhibition of new work at the Saint Louis Museum of Art, St. Louis and the National Gallery of Victoria, Melbourne, Australia during the coming year. 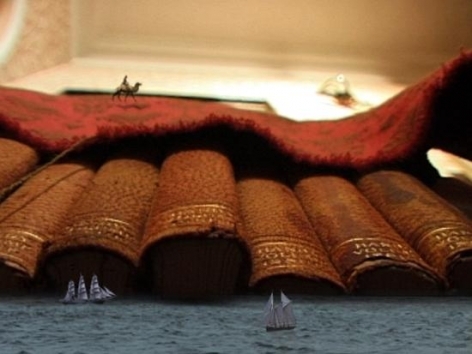 Sawa was also included in the Yokohama Triennial, 2005 and the Lyon Biennial, 2003.